As Al says - the problem is really pretty simple. If i run the strip on every third day, the date it appears on will start to float as of January 2nd after we hit the end of a 31 day month. 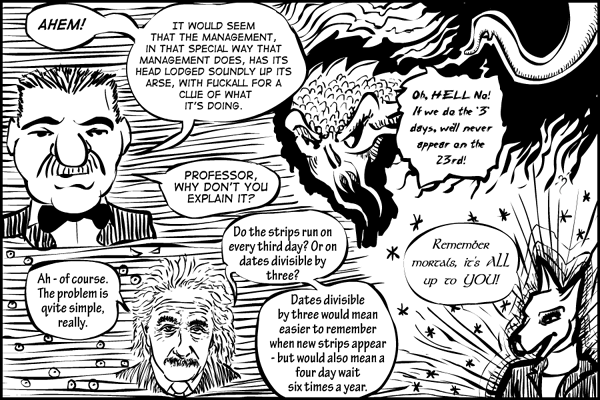 Would you rather keep track easily, knowing the strip comes out on the 3rd, 6th, 9th, etc.,? Or would you rather get those extra six strips each year? Reply here, or by private message or any way you think you can get through to me. We have until the end of December to decide. I was thinking the comic should update every 3 seconds. That way you would occupy almost every spot on the updated list all the time. Forgot, great job on good ol' Al there! Oh, now see - don't do that. Evil brain is already thinking how i can work an auto-updater while inking that would let the readers keep refreshing every 3 seconds and watch each strip being drawn. Fortunately, i'd have to put a script on their server, and they likely won't let that happen. This definitely seems to be a comic I'll be keeping my eyes on. Thanks, hopefully the actual comic will be to your liking. Check by on Sunday for the premier of Experiment One. Actually, it didn't take long before switching to 3 times weekly. M-W-F is even easier to remember. I like the way you started- almost as if you were testing material out in the sticks before bringing the show to town! Close. I was testing the system on the host and trying to figure how i wanted to work with things. The layout was also changing around in slight ways at that point, but that wasn't captured along with the strips. I should have taken some screen caps for posterity.